Are my pink rococo nursery ideas too fussy? 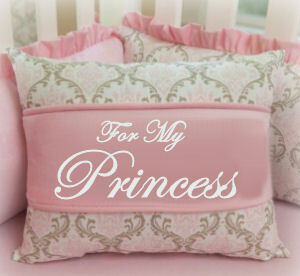 Will they overpower my baby girl's princess nursery theme? I've waited a long time for my daughter and my dream is to fill her room with beautiful furniture and a feminine crib bedding set. However, I want the atmosphere in the room to be delicate and refined, not tacky or overdone. Here are some the items that I have in mind. I love the look of this baby girl's nursery with the ornate ceiling medallion and the designer crib's tufted upholstery. 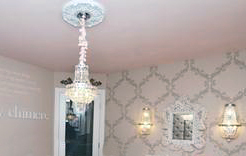 The medallion that I chose showcases the crystal chandelier with mini-shades that match the crib set for less than $20! Notice that there is nothing in the room that screams Princess Nursery Theme! 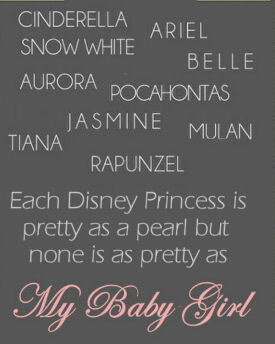 This one of my favorite quotes for a baby girl and it's an original; I designed it myself. The names of all the Disney princesses are, of course, not original but the little poem at the bottom of the wall art is all mine! Believe it or not, all of the baby bedding sets for baby girls made it more difficult to choose than if I had only had a couple to pick from; decisions, decisions! There are so many beautiful collections and fabric patterns that I liked. I ultimately chose the one that had just the right shade of pink. I finally found the perfect crib bedding set in the exact style in keeping with my baby nursery theme and color combination that I wanted. The moment I saw it; I knew that my search was over. These are just a few of the pink rococo nursery ideas that I had for my baby girl's princess theme room that I actually used. If I had bought all of the decorations that I had in my scrapbook the room would have come across as cluttered and fussy and visitors that stop by Unique-Baby-Gear-Ideas.com would probably not have admired it at all. Feel free to browse the rest of Unique Baby Gear Ideas to see how other moms decorated their baby girl's rooms.